BACKGROUND: The psychological adaptation to a cancer diagnosis is characterized by significant distress. Although distress levels in cancer patients have been reported to be the highest shortly after diagnosis and before treatment, few attempts have been made to study emotional adjustment during the diagnostic period of prostate cancer patients. This study's purpose was to determine whether differences in distress levels can be attributed to differences in diagnostic status, optimism, and/or coping strategies. METHODS: This study followed patients across 4 weeks, from prebiopsy to 2 weeks postdiagnosis, using these two time points as measurements. Data were collected between 1995 and 1998 at the Miami and Palo Alto VA Medical Center urology clinics. Biopsies were performed on 101 men (ages 46-87) to determine whether prostate cancer was present. These men completed prebiopsy and postdiagnosis questionnaires. RESULTS: Of optimism, coping, and cancer status, the only significant predictor of increased distress at postdiagnosis was dispositional avoidance at prebiopsy for both cancer and noncancer groups. CONCLUSIONS: Although these findings complement other studies linking avoidance with increased distress, the similarities between the cancer and noncancer groups underscore the need to consider both of these groups during the first few weeks of the prostate cancer diagnostic process. 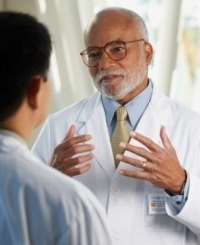 Prostate cancer diagnosis causes distress.